Since 1950, Tony La Russa has more wins than any manager in the big leagues. On Aug. 25, 2005, La Russa got his 2,195th win as a big-league manager when the Cardinals beat the Pirates, 6-3, at Pittsburgh. La Russa moved to third in career wins, ahead of Sparky Anderson (2,194) and behind Connie Mack (3,731) and John McGraw (2,763). Six years later, when La Russa, 67, retired from managing after leading the Cardinals to the 2011 World Series championship, he remained third in career wins with 2,728, just 35 shy of tying McGraw. Mack and McGraw compiled all of their wins between 1894 and 1950. Mack managed the Pirates from 1894-96 and the Athletics from 1901-50. McGraw managed the Orioles in 1899 and from 1901-02 and the Giants from 1902-32. La Russa managed the White Sox from 1979-86, the Athletics from 1986-95 and the Cardinals from 1996-2011. Anderson, while managing the Tigers, offered advice to La Russa when he was with the White Sox and Anderson remained a mentor to La Russa. 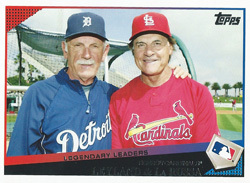 “Nobody was as ready to help or impart knowledge as Sparky,” La Russa told the St. Louis Post-Dispatch. The Cardinals made sure the achievement was treated as special. After the game, Edmonds spoke to his teammates in a closed-door meeting to make certain everyone understood the significance of the win. Reliever Jason Isringhausen presented La Russa with the ball from the final out. The players doused La Russa with beer. First baseman Albert Pujols playfully dumped a tub of ice water on him. Isringhausen said the beer shower was planned; the ice water dump was spontaneous _ and momentarily worrisome. “We were afraid his heart was going to stop,” Isringhausen told reporter Rick Hummel. The club brought out a case of Dom Perignon champagne and made a toast to their field leader. Team owner Bill DeWitt Jr. had come to Pittsburgh for the occasion. Roland Hemond was there as a guest of the Cardinals. Hemond was the general manager who promoted La Russa from Class AAA Knoxville and gave him a chance to be a big-league manager with the White Sox in August 1979. Jim Leyland, a coach for La Russa with the White Sox from 1982-85 and a scout for the 2005 Cardinals, presented La Russa with a personal check for $2,194 _ a dollar for each win that tied La Russa with Anderson _ to be donated to the manager’s Animal Rescue Foundation. La Russa thanked his wife, Elaine, and daughters Bianca and Devon. “Without the support of Elaine and the two girls, I would have been gone a long time ago,” La Russa said. Anderson had said La Russa could pass McGraw on the wins list. “I don’t think so,” La Russa told Hummel. During the 2011 season, though, La Russa privately determined he was ready to stop managing. He wasn’t getting enough enjoyment from the job, even though he still loved the game. In the book “One Last Strike,” La Russa said he spoke with his wife Elaine in September 2011 about his plan to retire from managing after the Cardinals’ final game that year.